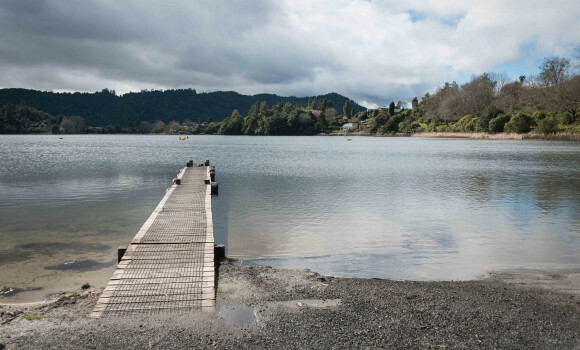 We are currently consulting on a long term resource consent application to increase the water discharge rate from Lake Okareka so that lakeside properties can be better protected from flooding. increase the water discharge rate from Lake Okareka to a maximum of 500 Litres/second by increasing the flow through the existing pipe system and add a second pipe and pump or replacing both with a single pipe at a later date. undertake short term and long term stream protection works in the Waitangi Stream. In 2001 RC 60776 was issued to allowed for the discharge of water from Lake Okareka via a controlled outlet at a rate of up to 239L/s. A series of significant rainfall events beginning in February 2017 lead to a rapid increase in lake level. These events and subsequent modelling showed that the existing pipe configuration and consent discharge limit of 239L/s was unlikely to have the capacity to discharge the water volumes resulting from large and more numerous rainfall events, particularly when considering the additional effects of climate change. The 2017 events lead to flooding of the lakeside margins and damage to lakeside paths and structures and risk to dwellings. Without intervention to increase the discharge flow the lake level would have continued to increase and it is highly likely that it would have resulted in damage to property. In June 2017 Bay of Plenty Regional Council invoked s330 (Emergency Works) of the Resource Management Act to increase the discharge from Lake Okareka to 360 L/s through the existing pipe and to add a second pipe and pump to give a total discharge rate of up to 500L/s and to undertake stream protection works to prevent erosion caused by the increased flow. This resource consent is currently in place alongside consent 60776. This consent application is to formalise the provisions in the emergency works consent into a long term resource consent. It is proposed that the emergency works consent and consent60776 will remain in place until this long term consent is granted. Last month a working party meeting was held with various parties from Lake Ōkāreka, Lake Tarawera and local iwi. 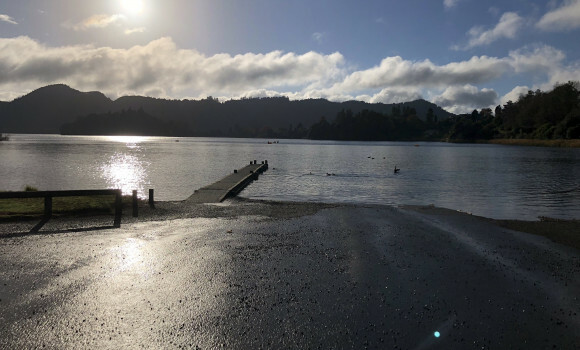 Check out images taken of Lake Ōkāreka water levels at Acacia Bay Reserve on 13 November 2017. An image taken of Lake Ōkāreka water levels at Acacia Bay Reserve on 13 November 2017. Stream-bank erosion protection work has been underway on Waitangi Stream this week. The aim was to complete work by 25 January so water flow from Lake Okareka could be increased to 500 l/s, which has been done. 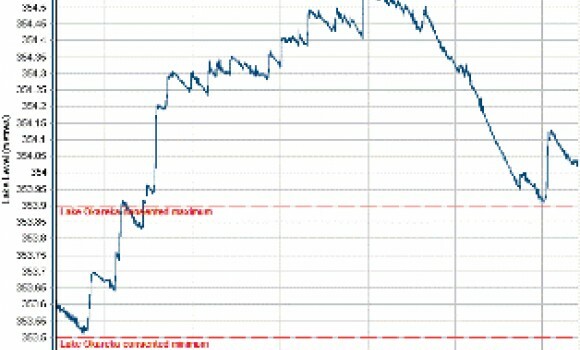 As shown in the graph below, the Lake Okareka water level has been dropping in recent weeks and is almost back within the consented range. We will continue to monitor lake level changes and keep you informed.